Displays well. Glove is over 30 years old and leather feels good and holds it's shape. It is a PG32 Fastback Rick Burleson. Rick played mainly for the Boston Red Sox from 1974 -1980. Extremely nice vintage Wilson model A2250 Jim Rice endorsed baseball glove; very little use; great for play or display; Shipped with USPS Priority Mail. Beautiful vintage / antique hall of famer Ted Williams Wilson leather baseball glove. A True Collectors Item! Dates & patient numbers stamped on the outside of the glove, from Wilson Co. Canada. This is the TED WILLIAMS Signature Model A2115 Wilson Ball Hawk, with Grip-Tite Pocket. Has "Ted Williams Fieldmaster" over Teds Image in the palm the of The glove and Button down wrist strap. The leather is still soft and plyable, still has that awesome leather small. Very Nice Glove indeed, aside of the original wear from use, there is a name written on the wrist strap probably that of the original owner or user. Please see photos. Comes from 100% smoke free / pet free home. Please message with any questions. Happy eBaying! 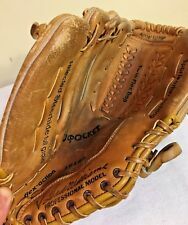 Vintage 1960's Rawlings Tony Conigliaro RH Baseball Glove Model RS25 RARE!!!! Who knows what Tony could have done if he had never been hit in the face. If you carry his average numbers over the course of a 20-year career, his numbers are quite impressive. Here is my theoretical evidence. C lean & straight. See Condition above & in photos. Scarce & hard to get. A Must for the Red Sox fan! from the 1960's or 1970's. Good usable, or collectible, Condition. Good condition for age. The leather is not hard. The leather lacing is original. The cloth Hutch patch is missing from the wrist strap, see all photos. It is in AS FOUND in an estate condition, I have not cleaned or oiled it, period. 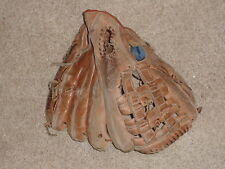 Used baseball glove as pictured, with general wear from active use. All stitching is intact. The lacing is intact and appears original. The stitched Wilson label is intact. Fisk's fascilimle signature is readable. Williams retired from playing in 1960. Genuine Leather, Fielders Mitt with Triple tunnel bridged web. from the 1940's. Very hard to find! signature model Wilson, 614 Glove in very nice shape. Lower palm is marked: 'Wilson, made in USA, 614'. Fully Conditioned and ready to use. The glove is from the 60's making it 55 . The leather and lacing are in excellent condition (One lace as broken.). Even the cloth logo on the wrist is in very good condition. This is a good right handed small baseball glove model number 16144. It has a Pro-Style Pocket, Flex Action and Nylon Stitched. Nice glove. About Jack : Jack is a reasonable guy. He also knows that more often than not people are as reasonable as he is. Jack has faith in you. Have faith in Jack. Signs of normal use,overall solid good condition. Hard to see- Last pic but I believe the model is 1632. Great Glove on a budget. depending on size of the player. You should know what size your player needs. Age use prob 10 up through average adult. OBRK, LOC BOX1 O12463-1 (12) O1N.RO. SPECIAL REQUEST. Fully Conditioned and read to use. All original. 10" pattern Youth model for a Right Handed Thrower. No stray marks. No cracking. Soft & flexible. Patch intact. Interior palm leather is smooth.Scarce collectible glove in Very Good condition. Genuine, Leather Left Hand (thrower) Fielder's Mitt with split finger design. Williams retired from playing in 1960. from the 1940's. 9 1/2" Tall & 11" Wide. a Great Looking,early Glove. perfect Display! Vintage Wilson Jim Rice A2250 Baseball Glove 10 1/2"
VINTAGE HUGE BASEBALL GLOVE #2, TED WILLIAMS #16172, Ex++, LQQK, NICE, WOW! Glove is in great shape. Old price written on inner pocket of glove. Outside is very clean and flexible. Excellent Condition. Fully Conditioned and ready to use. Good overall condition, nice addition to your ball glove. CARL YASTRZEMSKI MODEL SPALDING BASEBALL GLOVE! In very good condition. The markings and insignia on this glove are in fantastic condition. This glove is for a right handed thrower. Jensen played with 3 teams during his MLB career including the Yankees & the Washington Senators but at Boston for the longest stretch. Good condition for age. The leather is not hard. The leather lacing is original. More than just a pretty picture. Try Image Hosting. Don was an average hitter & fielder and started his career in 1956. Played for the Red Sox 1956 to 1961. He than went to the Houston club in National League and then the Detroit Tigers both in 1962 and ended his career. 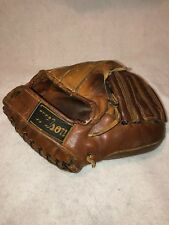 VINTAGE SEARS FASTBACK BASEBALL GLOVE, "TED WILLIAMS" #16158, EX++, LQQK, NICE! VINTAGE WILSON #3599 PEDRO GUARRERO BASEBALL GLOVE #1, EX+, LQQK, NICE!! Wilson A2250 Jim Rice Baseball Glove Pro Special All Leather New Pocket Lace 12"
New Pocket, Fingers Web, Lace. Fully Conditioned and ready to use. RARE Rawlings PG 18 Glove Dwight Evans BOSTON RED SOX Great! Check The Pictures! PG 18 model “The finest in the field”! Good Rawlings labels and strong lettering in signature. Laces and pocket are all in good shape. Truly a rare find with good labels. Left handed throw Baseball/softball mitt! JSA AUTHENTICATION COA WITH MATCHING SERIAL NUMBER STICKER INCLUDED. SIGNED ON A PRO GGP200-9C RAWLINGS GOLD GLOVE GLOVEIN BEAUTIFUL NEW CONDITION. Nice Ted Williams Baseball glove by Sears Roebuck& CO. Nylon Stitched, Pro Style Pocket, Flex Action, Custom Built. RHT Adjustable Wrist Strap. VINTAGE TED WILLIAMS SIGNATURE BASEBALL MITT SEARS ROEBUCK BRAND #16182 RED SOX Left-hand catching vintage Ted Williams baseball glove, Sears Roebuck brand, #16182. Mitt is in well-used condition with "pinky" finger's laces missing. Please examine photos carefully. Payment via PayPal is due within five days of auction's close. US bidders only, please. Thanks for looking! RIGHT HAND. GOOD CONDITION - WITH NORMAL SIGNS OF WEAR! 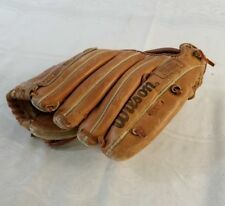 VINTAGE SEARS LEFTY BASEBALL GLOVE, TED WILLIAMS #16183, EXCELLENT, LQQK!!! Used. Name written inside. See photos. Vinyl with leather lace. Made in Taiwan .